According to the Institute of Medicine's Food and Nutrition Board, which is responsible for setting recommended daily intakes for nutrients, most men need about 56 grams of protein per day, while most women need about 46 grams daily. Compared to these recommendations, 200 grams of protein seems like overkill. However, in some cases, you may need more protein than those in the general population. For example, if you're a bodybuilder whose goal is to put on lean muscle mass, 200 grams of protein may be necessary to meet your needs. Avoid powders, pills and other supplements by getting all the protein you need from nutritious whole foods. Divide your protein needs into three regular meals and three snacks. To get 200 grams of protein a day, you'll need to consume roughly 50 grams of protein at each meal and 17 grams with each snack. Choose protein-rich breakfast foods, including cottage cheese, eggs and nut butter. 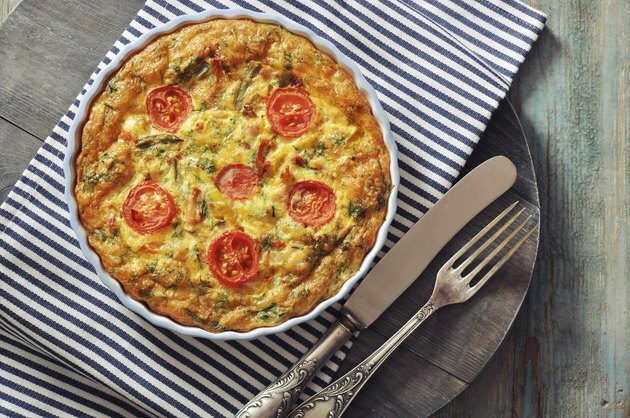 To get about 53 grams of protein in your morning meal, have 1 1/2 cups of reduced-fat cottage cheese topped with fresh fruit, a two-egg omelet with sauteed spinach, and a piece of whole-grain toast spread with 2 tablespoons of almond butter. Consume one 8-ounce container of nonfat Greek yogurt for a mid-morning snack. This will provide you with exactly 17 grams of protein. Cook a 3.5-ounce grilled chicken breast for lunch. Paired with a 1/2 cup of quinoa and a 1/2 cup of steamed lentils, this will give you 53 grams of protein. Steam 1 cup of frozen prepared edamame or green soybeans in the microwave with just a dash of salt. This mid-afternoon snack will provide another 17 grams of protein. Bake a 6-ounce filet of wild Atlantic salmon for dinner. Add a side of 1 cup of Asian-style soba noodles and 2 cups of raw spinach lightly steamed or sauteed for a total of 51 grams of protein. Drink 1 cup of reduced-fat milk and eat a 1/2 ounce of Swiss cheese before bed to bring your daily total to 202 grams of protein. Cook with healthy monounsaturated and polyunsaturated fats, such as olive and canola oil, to limit your intake of unhealthy saturated fat and improve your heart health. Eating too much protein can cause health problems, including dehydration and calcium loss. It's best to discuss a high-protein diet with your doctor to make sure it's healthy for you. ACE: Are There Health Risks Concerning Eating Too Much Protein?